Saw this movie last week and disliked it at first. Without going into spoilers, I was probably in the wrong mindset to enjoy it properly. But, it stuck with me for days later and I couldn't stop thinking about it. I ended up liking it a lot and will re-watch it as soon as I get the chance. It's visually stunning and the soundtrack complements the visuals perfectly. Soundtrack is getting released in September and I will definitely get it. Not an easy movie to digest, even though there are some scenes that will definitely leave you wondering if they were meant as comedy or if they were just done wrong. This mostly comes down to Cage's somewhat uneven performance - but it's nothing like Wicker Man and it only comes down to a couple of individual shots. Whoa. How many times during Mandy did I think "dang, am I on acid?" 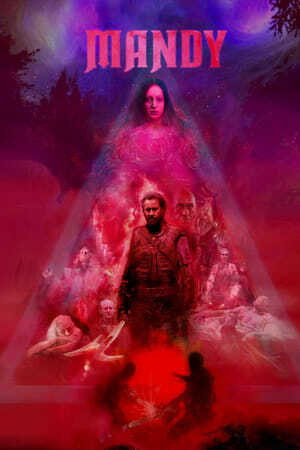 Director Panos Cosmatos is intentional with this aspect, using color bends and blends to give Mandy an overall hallucination-like vibe to go with the 80's backdrop the movie takes place in. All cool color effects aside, Mandy suffers from an extremely long start, one of those long Deer Hunter intros establishing the relationship between its protagonists (Cage and Riseborough). Its completely unnecessary in length, even if the look of it all keeps it from putting audiences to sleep. But once the Charles Manson like bad guy Jeremiah (played well and against type by Law and Order's Linus Roache) enters the fray, its a nonstop ride to the finish. Cage is in rare form here after so many bombs and its hard not to root for this to be the beginning of a comeback for him.